Cite page (MLA): Simpson, Kate, and Megan Ward. "Livingstone Online Outreach Program." Livingstone Online. Adrian S. Wisnicki and Megan Ward, dirs. University of Maryland Libraries, 2015. Web. http://livingstoneonline.org/uuid/node/e5b11e17-a894-4e30-b7fa-fabfc2177fdc. This page introduces the Livingstone Online Outreach Program, discusses the overall goals of the educational worksheets produced through the program, and describes the support from Livingstone Online available for instructors who would like to use the worksheets in their classrooms. The Livingstone Online Outreach Program is a web-based educational resource situated within Livingstone Online. It provides materials for teachers to guide students aged 9 to 13 in learning about the life and work of David Livingstone. Through Livingstone’s writings, students can explore many important nineteenth-century issues that continue to resonate in our own time. Using our series of eleven educational worksheets, teachers can cover topics ranging from abolition and global citizenship to the industrial revolution and African animals. The materials also encourage students to explore Livingstone Online on their own. 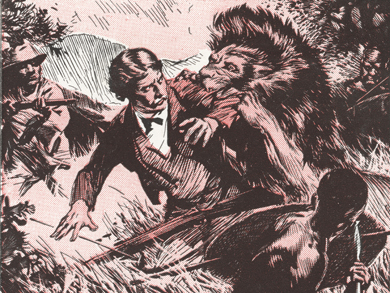 Through these resources, students can better understand the historical and cultural impact of David Livingstone’s nineteenth-century life and travels in Britain, Africa, and elsewhere. Each worksheet takes as its starting point a letter, diary entry, or piece of text by Livingstone, through which students can explore a specific topic in depth. For instance, students might read an excerpt of a letter Livingstone sent to a friend in order to learn about nineteenth-century expeditions and how maps were made. Students are encouraged not only to answer the questions posed on each worksheet but also to discuss the wider issues surrounding each topic, including its relevance in their own lives and in contemporary geopolitics. For the duration of LEAP (2013-17), educators and foundations will be able to email Kate Simpson at Edinburgh Napier University in Scotland and Megan Ward at Oregon State University in the U.S., who will provide resources and offer support. As well as using email to provide support, we also have a twitter handle, @livingstone13d, to encourage debate and further conversation. The outreach program has been a truly multi-agency effort and would not have been possible without the assistance of David McClay and Alison Metcalfe at the National Library of Scotland, and Anne Martin and Alison Ritchie of the David Livingstone Centre.